Are you concerned about safety when you travel with the kids? Of course you are! Carefully choose safe travels for your family vacation. Have your friends given you grief when you announced your travel destination? Are there places on your bucket list that you haven’t been able to see because of safety issues? Wondering how to choose a safe travel destination? I hear you. Istanbul has always been high on my list of dream destinations and when we prepared for a trip there in 2015, ISIS was just rearing it’s ugly head in Syria. Friends were shocked at our choice and wondered if safe travels were possible there. We did lots of research before we decided it was safe enough to go, and with the kids! All parents are less interested in taking risks when the kids are involved so research is really important before a trip to ensure safe travels. We had a fantastic, thrilling, life changing, and VERY SAFE, adventure in Turkey. See some amazing photos we took here. Safe Travels – Where to Go – First Google. Google, “Is it safe to travel in _______ ?” Read the DATE on articles before reading. Anything more than a few months old isn’t worth your time so skip those. You need the latest and greatest information. Remember… in this case, no news is good news. If you don’t find anything then there isn’t much newsworthy bad stuff going on. Bad stuff always makes the news. Again, the computer will help you find the information you need! Start with US Travel and Passports International Travel: Travel Alerts and Travel Warnings Type in the potential travel destination. If you see “No Results” pop up then according to the US Department of State you are good to go. Read the information carefully and then consult a map. The issues might be very far away from the area you are going to visit. Look at the individual country’s tourism website. Type ‘crime’ in the search box and read what they have to say. Some might argue that the country isn’t going to say anything bad about their own country…but on the other hand, they need happy visitors…not just visitors, especially the ones that go home and tell everyone not to visit! It is in their best interest to give correct information. Checking out the Traveler’s Health section of the Centers for Disease Control (CDC) website can let you know about health safety concerns. *food safety – Is the water safe? Should you drink tap water? Checking out the World Health Organization is another place to find out about health concerns in any member of the United Nations organization worldwide. Here you’ll find the most recent information on the Zika virus. Expats are Americans living in other countries. When you can find information from expats you’ll find cool information from people who have had time to really get to know the local culture. Safe Travels – Where to Go – Talk to the Locals. We live in the technology age for sure and as technology improves….the world shrinks. A wonderful example of this was during my own research for a trip to Turkey. ISIS had just reared its ugly head in Syria and we were concerned. I found a lovely travel guide in Istanbul; Lale Aran of SRM travel. She is a wealth of information (She ACTUALLY wrote the book on visiting Istanbul for Rick Steves.) and a delightful person! I expressed our concern about going east of Istanbul into the dreamy Cappadocia area as it is to the east of center of the country and thus so much closer to the Syrian border. “Cappadocia is very far from Syria. Even close to the border in Turkey it is ok to travel as long as you have decent travel assistance. I just had a group of Americans who toured Eastern Turkey and South Eastern Turkey, they trip ended just a few weeks ago! They went to towns which are in the Turkish side of the border, as Urfa and Harran and many other places in that geography. So, not only Cappadocia, you can extend your trip even further east and south east. Think about that for a second. Her friends, fellow citizens of Turkey, were afraid of US schools – your school – schools that we send our children to every single day without concern. It is true we have had some school violence, but thankfully it is rare and should certainly not prohibit someone from visiting the United States. It really struck me as….silly! Of course the US is safe. Of course the US schools are safe. Of course people should visit! But sometimes the media makes things look worse than they are, or doesn’t give you a point of reference to know how widespread, or not, a problem might be! Lale was such a wonderful source of information that we got to know each other well during our online talks and Skype. She invited us to her home in Istanbul. Read the details here of our wonderful experience with her. I would HIGHLY recommend a family holiday to Turkey with assistance from Lale. Safe Travels – Where to Go – Beware the TV. You can not get a complete picture regarding travel issues just from the tv media because the perspective is off. There are some nuts here in the states, too, but I hope the rest of the world isn’t judging all of us on their crazy actions. We’ve had some terrible tragedies here in the states – school violence, but we still send our kids to school for example. World travelers need to keep things in perspective. Safe Travels – Where to Go – Know the law! A wise traveler knows the law to stay on the right side of it. Usually these things are pretty obvious: Don’t steal, for example which is what a US student is being held for in North Korea at the moment. (His theft is allegedly caught on video.) But, not always so obvious. We here in the US, for example, are used to being able to speak our mind. This isn’t always legal in other places. Use common sense and when it doubt – don’t. A wise traveler knows the cultural law to stay on the right side of it. Travelers visit the ends of the earth to learn from others, to see a different side of things, to revel in the differences. You can, and should, do all of that AND be respectful at the same time. Take clothing, for example, sometimes it is a great idea to cover up a little bit to blend in a little. Just because we wear skimpy spaghetti straps in the US does not mean it is a good idea to do it everywhere on the planet. Also, dress the part. In muslim countries, for example, show some respect and cover up. No need for a burka, but no need for a tummy baring tube top either unless you are on a beach. Notice how Lale, of SRM Travel, and her friend are dressed in the above photo. These ladies are residents of Istanbul and Muslim women yet bare arms, no head scarf, and a short skirt are the choice. I, on the other hand, a Christian woman from the US (home to 1/2 naked celebrities) is much more covered! Read reviews on Trip Advisor. I love this site, and you can read my Trip Advisor reviews here, because the reviews are from real travelers and are recent. Check the dates! 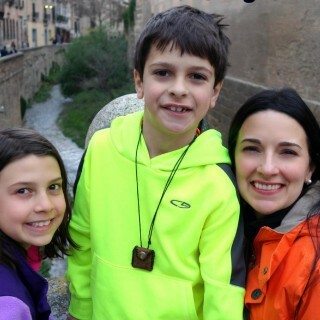 Read what a recent family traveler has to say who was really there just last week. Were they worried? Concerned? Did they feel safe? Did the kids have a good time? Safe Travels – Where to Go – Go with your gut. If now isn’t the time to visit a place because of your comfort level, then it just isn’t. The world is a big place! Choose a destination that feels right – right now! Safe Travels – What about the US? Is the United States a place for a safe trip? YES, the United States is a safe travel destination. The country is HUGE and there are so many wonderful things to see. People are warm because the entire country is a melting pot. Here you’ll find people from all over the world – their cultures, their food, their religions, their dress, their music. Read more about how the US is a good place for a safe trip! Read more on Why Traveling Now is both possible and important! No matter where you choose to go on your family vacations, be sure to get the kids ready first! Use The Educational Tourist’s travel guides for kids. Click on your destination below to download the travel books for kids! If you need help planning family vacations of your dreams, give me a shout! Some really smart ideas and resources I hadn’t though of before, thanks for sharing!